Behold Liika, the redesigned ironing board that brings clothes-pressing technology forward to the current century after at least a hundred years lying dormant. Its boomerang-shaped design has suction cups on the ends of articulating legs that let you attach it to a table or even a wall or window. Let's just hope those suction cups don't let loose at the most inopportune time. 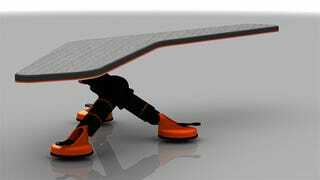 It's about time somebody improved the ironing board, and it was designer Tony Zakrajsek who finally stepped up. Two more pics and some pithy ironing commentary that could get you laid, after the jump. For some reason, the lowly ironing board's design has stayed the same, but were we ever satisfied with its rickety and squawking design? How unpleasant does a household tool need to be before it's finally redesigned? I mean, is that ear-splitting noise that it makes when you open it—sending shivers down your spine with its metal-grating, hollow howl—somehow acceptable? And then there's that primitive latch/release mechanism, probably designed in medieval times to release a rock thrown at a castle with a catapult. WTF? So thanks, Tony, for putting together this swank design, looking like a cross between a running shoe, an R/C airplane, a glass carrier and a skateboard. It's sure to get lots of ironing done, that is, if any brave soul sees fit to step up and actually manufacture it. iRoningBoard, anyone? And guys, get familiar with the ironing board and its associated arts. After all, I once heard a woman who spotted a certain man at work with an iron describe the sight as the sexiest thing she had ever seen, with immediate rewards bestowed upon that lucky recipient. Male ironing, FTW. Whatever works.